Raising Awareness, Hope and Healing. Please wear BLACK & GOLD to stand together against domestic violence and abuse. 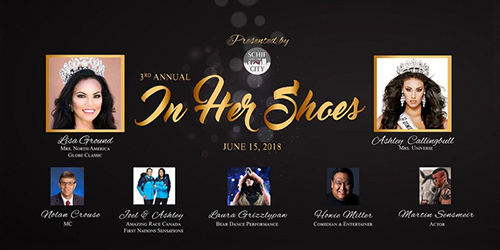 On Friday, June 15th please join Lisa Ground, Mrs. North America Globe Classic for the 3rd Annual In Her Shoes Gala, an evening of raising awareness, hope and healing for those suffering from domestic violence and abuse. Powerful stories and inspiration from survivors will be shared. You will hear stories of resiliency and inspiration from Ashley Callingbull, Mrs Universe and Finalist on Amazing Race Canada. Tickets for the event are $150 each or purchase a table (10) for $1350. EARLY BIRD PRICING IN EFFECT UNTIL APRIL 30, 2018 – Tickets only $100 ! No. However, due to the stories being shared; they will not be appropriate for young children. Guests are strongly encouraged to wear formal wear. Ribbon shirts and skirts are most welcomed! Ladies in cocktail dress/gowns. Jeans, ballcaps and casual wear will not be permitted. Guest are encouraged to wear black & gold to stand together against domestic violence and abuse. Also, any color ribbon shirts and skirts are most welcomed. No. However, you can transfer your ticket to another guest at no charge. To request transfer of ticket, please email the organizer via Eventbrite. Where can I contact the organizer if I have any questions?